You may have seen posters for yoga workshops at your local studio, or heard your teacher mention them at the end of class. Why are workshops on offer, and what is their purpose? If you go to regular classes, why would you need to invest in a 2 or 3 hour workshop? What would you gain? When I first got into ashtanga yoga in a big way, I was so excited about it, I spent a few years going to as many workshops with senior teachers as I could. One weekend in 2002 or 2003, John Scott was teaching a weekend of workshops, and I signed up to all of them. I soon realised that you were not meant to go to all of them, that they were all full on practises, and by the end of it, I was so exhausted! But, it was worth it – I learnt some invaluable things that are still with me. I learnt how to do the ashtanga jump through with straight legs at a John Scott workshop. Not instantly, but it taught me the technique and alignment, which I took away and practised, until shortly afterwards, I got it. Alignment and technique are often skipped over in classes, simply because the focus is on the flow. In ashtanga for example, the meditative quality that’s achieved by flowing through the postures (vinyasa) combined with breathing (ujjayi) and gaze points (dristi) is prioritised. Some teachers do mention alignment but there is usually not enough time to get down to details. 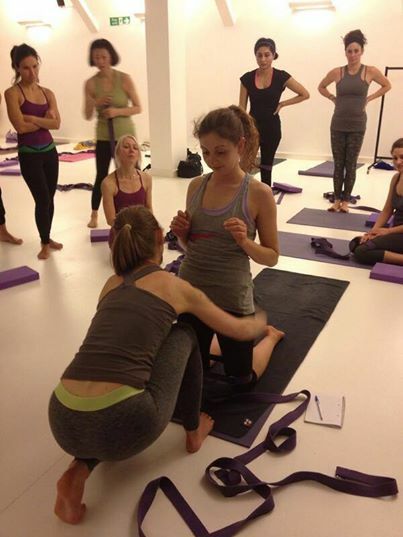 In a workshop setting, alignment of postures and directionality (actions) are explored in detail, as well as techniques of how to do postures you might be finding difficult. We look at what muscles should be working in each pose, how to engage them, and what should be relaxed, in order to reach that well known yogic dichotomy: the balance between strength (sthira) and ease (sukham). Sometimes muscles become dormant and cause others to compensate, which can lead to injury. Learning what should be working when is an invaluable addition to your practise and effects wellbeing, as leads to integration (one of the meanings of the word yoga!) and integration feels great physically, mentally, and energetically. Neuroplasticity is the scientific study of pattern formation and pattern change, and when students notice how good it feels to do a pose in an integrated way, compared to a non-integrated way, and start practising like this, it enables a gradual (this cannot be done instantly) rewiring of the brain, as new neural pathways are established. Meaning, it is possible to make positive changes in ourselves, and even facilitate healing. During workshops I often have students say to me “wow, it feels completely different doing it that way!” which I am always delighted about. Workshops are a fantastic forum to voice your questions! I encourage questions because I love how they open up a dialogue, and highlight the areas you are curious about. I have the chance to demonstrate and discuss the topics in detail and with student interaction I can gauge whether the class has grasped what I’m teaching. Questions are a great way to get involved, clarify and integrate what you’re learning. Yoga classes can be busy, and it’s not always possible for the teacher to adjust or correct everyone, or to see everything that everyone is doing. In a workshop, you get more attention. Your questions are taken up, and any bad habits can be ironed out, because there is more time and space for adjustments, demonstrations, and to think and talk about what you might be doing and what needs to change. The experience of a yoga workshop is fun, enlightening (lots of ‘aaahhh!’ moments) social and uplifting. You are in a room with the teacher you love, and a bunch of students who are as crazy about yoga as you are. The experience of working and learning together is really inspiring, and you will leave with lots of new things to work on and think about. From the teachers perspective, we get to know you and your practice better, have some fun, and feel proud of you when we see your practices deepen and improve.